Praise & Worship flags for children. 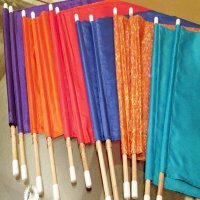 Colorful worship flags that are just the right size for little hands. Lightweight silk or lame' fabric makes them easy to use for worship or praise.